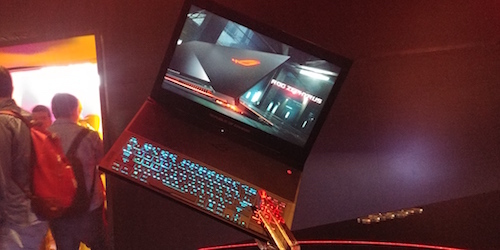 ROG Zephyrus is the World’s Thinnest Gaming Laptop! 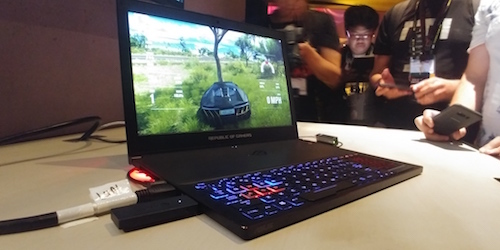 We attended the ASUS ROG event in Taipei earlier and though I expected a lot more products to be announced, all of us were blown away by the introduction of the ROG Zephyrus. It’s now considered the world’s slimmest gaming laptop powered by a 7th Gen Intel Core i7 (Kaby Lake) processor and the latest NVIDIA GeForce GTX 1080 graphics. What the f***!!! 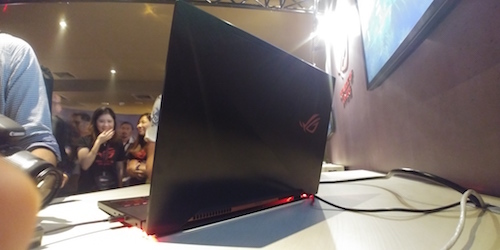 The 15.6-inch Zephyrus features an ultraslim profile and incorporates the ROG-exclusive Active Aerodynamic System (AAS) — a specially designed cooling system. It also features customizable ASUS Aura RGB lighting effects and a super-fast 120Hz panel with wide-view technology, 100 percent sRGB color gamut and NVIDIA G-SYNC for breathtaking gaming visuals. So now we have this ultraslim gaming machine, the question is, does it have an efficient cooling system? As mentioned earlier, the ROG Zephyrus is cooled by the AAS which runs cooler and quieter without sacrificing performance. 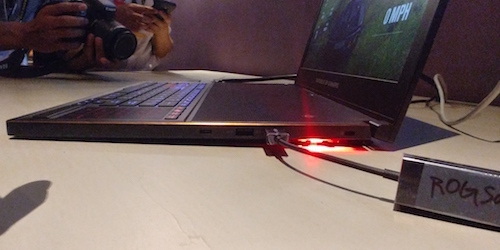 AAS incorporates unique AeroAccelerator (AA) technology that increases the speed and efficiency of airflow through the laptop. The fan’s 3D-curved surface cover and accelerator guides enhance airflow and move heat away from the components more efficiently. When Zephyrus is opened, a portion of the bottom of the chassis flexes to increase the airflow volume by 20 percent and further increase air circulation. AAS maximizes system stability as well as gaming and thermal performance, and it allows full utilization of the CPU and GPU, so gamers can engage in marathon sessions without fear of interruption. The ROG Zephyrus features a keyboard positioned at the front of the chassis — a design that allows better cooling of internal components while providing a more comfortable and familiar experience for gamers accustomed to desktop keyboards. It was awkward to look at at first, because we’re used to see the keyboard positioned near the hinges of the laptop. 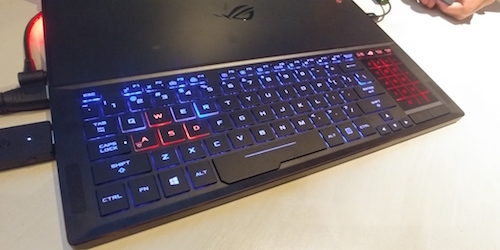 ASUS Aura RGB lighting technology provides dynamic and customizable lighting effects over the entire keyboard, as well as separately highlighted customizable effects for the WASD and QWER key groups, allowing users to create a gaming ambience that matches the feel of their game. The ROG Zephyrus is equipped with a 120Hz display that enables smooth gaming at a true 120Hz frame rate. NVIDIA G-SYNC display technology synchronizes the display’s refresh rate with the NVIDIA GeForce graphics card’s frame rate, ensuring ultrasmooth visuals. Wide viewing angles and a 100 percent sRGB color gamut also allow the panel to produce outstanding, lifelike colors from any angle. The laptop is also equipped with a USB Type-C™ (USB-C™) port with Thunderbolt™ 3, allowing G-SYNC and 4K UHD display output, fast data transfers and power delivery. I don’t have the full specs as of the moment, but I will post updates in the near future as soon as I have them. We’re not sure when it will be released in the Philippines, but I’m hoping that ASUS Philippines will release it soon.